It’s hard to believe, but we are just weeks away from the 2019 CSCCa National Conference, and we sincerely hope to see you there! In addition to great speakers and activities, a key part of the conference each year is a large, dynamic exhibit hall, showcasing the latest products and services in strength training, conditioning, speed & power development, sports nutrition, recovery, strength & conditioning technology and more. Gatorade offers a range of sports fuel products backed by years of scientific research, developed in collaboration with the world’s greatest athletes and designed to improve athletic performance. Gatorade’s portfolio is designed to meet the fueling needs of all athletes, and its Recovery products – bars, protein powder and shakes – help athletes rebuild muscles after athletic activity. To learn more about Gatorade’s full product portfolio or to find your local Gatorade representative, please visit https://performancepartner.gatorade.com/products. Proudly made in Sweden by skilled craftsmen since 1957, Eleiko bars and strength equipment continue to be the leading products in the sports of weightlifting and powerlifting, as well as in the strength & conditioning profession. Eleiko products are delivered to over 180 countries and are used to equip the world’s largest events, including the 2015 Weightlifting World Championships in Houston and the 2012 Olympic Games in London and more than 1,000 world records have been set with an Eleiko bar. Weight rooms need surfaces that are just as tough as the athletes who use them. Mondo’s 70 years of expertise goes into its rubber weight room flooring so they stand up to the most demanding use. Engineered to withstand the weight and abuse of sport equipment, Mondo’s MondoArmor, Sport Impact and Ramflex weight room floorings are ideal for strength and conditioning areas, fitness centers and weight rooms, offering enhanced resiliency from the dropping of weights, heavy machinery, abuse from strength and conditioning activities, scratches, scuffs and even sweat. Don’t be fooled by flooring that only meets some of your needs. Choose one that exceeds all of them. One that can stand up to the heaviest everyday use. Keiser is never satisfied with the status quo and strives to find solutions that push the limits of fitness science to elevate human performance. Because . . . “Good Enough” Isn’t. 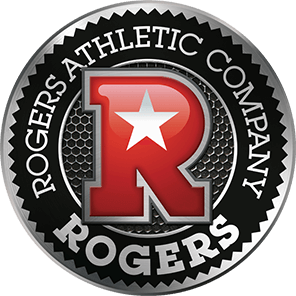 The most serious athletes train with Rogers Athletics Strength Training equipment. Our innovative Brute Rack System will give your athletes a closed-chain, free-weight training experience. Out revolutionary Pendulum plate-loaded machines allow athletes of all sizes and levels to super-target and maximize the benefits of muscle groups more safely with less stress on the spine and the body’s more fragile joints. Iron Grip builds its heavy-duty dumbbells, fixed barbells, weight plates, and Olympic bars exclusively in the US to survive the toughest workouts. As the world’s largest provider of commercial free weight equipment, Iron Grip supplies premier fitness facilities worldwide, including major health club chains, professional and university athletic training programs, and all branches of the US military. Rely on Iron Grip for innovative engineering, dependable construction, and long-lasting performance. 1) Combating the symptoms (cramps, muscle fatigue, light-headedness etc.) caused by heavy sweating, dehydration and electrolyte loss. 2) Protecting the body from overheating in high heat settings and times of intense exertion. 3) Increasing endurance by over 20% more than any other NASA-tested formula. Plus, it is a high-performance aid against the negative effects of jet lag and high altitudes. The Right Stuff is NSF Certified for Sport and is now available in seven different flavors including new Grape. Whether you’re building a small weight room or major training center, Perform Better’s expert staff will work with you from layout to installation to create the facility that will best meet your needs and budget. Not only are we the top source for functional training equipment, but we are the premier “one-stop shop” for all your fitness facility needs. Woodway treadmills give your athletes the advantage in their training and conditioning because WOODWAY is built unlike any other treadmill. Each treadmill is custom-designed with our patented running surface and ball bearing system. The running surface is made from rubber T-slats giving your athletes the ultimate cushion and softness, while maintaining the natural biomechanics of their stride. Unlike conventional treadmills, WOODWAY treadmills also eliminate belt slippage allowing you to project true speed accuracy that does not vary with the weight of the user. When hundredths of a second separate winning and losing don’t settle for anything but the proven leader in performance treadmills. WOODWAY treadmills are stronger, faster, and more durable allowing you to train athletes more effectively. Trust the treadmill that was built for and proven by elite athletes and coaches around the World. For the Long Run. Since 1976, Samson Equipment has provided the very highest quality strength training equipment on the market. Now prepare yourself for the NEW look of Samson! New product upgrades, New designs, New products, New technology, And same famous durability! Like never before, Samson Equipment is fulfilling its promise to you the strength coach: We will deliver you the very best custom weight training equipment in the world. At Matrix Fitness, we know the path to victory starts long before your team takes the field. Our high-performance training equipment will help your athletes get the most out of every moment of their workout. With dozens of ways to customize our equipment, you can make sure your athletes are getting the work they need, where they need it. And since your team never takes a day off, every piece that hits your floor will come with the durability to stand up to rigorous exercise day after day for years. Matrix Fitness – victory starts here. Rapid Performance is a product of Country Ovens, LTD. in Door County Wisconsin. Door County is the peninsula that hangs off of the state into Lake Michigan and is part of the Niagara Escarpment. Our warm days and cool nights, sandy shallow soil and being surrounded by water makes the perfect climate for growing the world famous Montmorency Tart Cherries. Rapid Red is 100% all natural Montmorency Tart Cherry Juice (not from concentrate). Montmorency Tart Cherries contain anti-oxidants that assist in the relief of muscle inflammation, pain and fatigue. Anti-oxidants counteract the enzymes that are responsible for these muscle irritations and allows athletes to recover faster. Known as the “New Super Fruit”, Tart Cherries provide significant levels of Beta-Carotene (19 times more than blueberries and strawberries), potassium, vitamin A, vitamin C, calcium and iron. They are also fat free and gluten free. Rapid Whey is simple! Take the muscle recovery benefits of Rapid Red and combine it with the power of pure Whey Protein Isolate. With 12 grams of Whey Protein Isolate, Rapid Whey is an all natural recovery drink that was developed to speed recovery. Whey Protein Isolate contains high levels of Branch Chain Amino Acids (BCAA). 9 of the 22 Branch Chain Amino Acids can only be obtained through food sources. Of these 9, Valine, Isoleucine and Leucine are the most important and are all found in Whey Protein Isolate giving your body the building blocks it needs for energy, muscle development and rapid recovery. BiPro’s nutritional profile and delicious taste make it the protein of choice for strength and conditioning coaches, as well as leading professional and collegiate teams across the country. The brand’s whey protein isolate powders are all-natural and offer 20 grams of protein per serving without artificial ingredients, sugars or fillers. BiPro’s unique process of isolation is gentle, yields a product that is pure and contains all essential and branched chain amino acids (BCAAs). BiPro Protein Water is ideal for athletes because of its portability and virtually unparalleled ingredient list. One bottle of protein water packs 20 grams of whey protein isolate in just 90 calories with zero grams of sugar, carbohydrate or fat. All BiPro products are NSF Certified for Sport and will help your athletes take their performance to the next level. Founded in 1996 by former University of Maryland football player Kevin Plank, Under Armour is the originator of performance apparel – gear engineered to keep athletes cool, dry and light throughout the course of a game, practice or workout. The technology behind Under Armour’s diverse product assortment for men, women and youth is complex, but the program for reaping the benefits is simple: wear HeatGear when it’s hot, ColdGear when it’s cold, and AllSeasonGear between the extremes. Under Armour’s mission is to provide the world with technically advanced products engineered with our superior fabric construction, exclusive moisture management, and proven innovation. Every Under Armour product is doing something for you; it’s making you better. 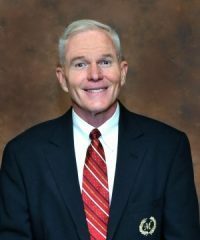 The support of our generous partnering sponsors assists the CSCCa in meeting the unique needs of the collegiate and professional-level strength and conditioning coach, enabling the organization to keep its membership dues and conference registration fees to a minimum while offering the highest level of certification, educational resources and opportunities, and advocacy for the profession. 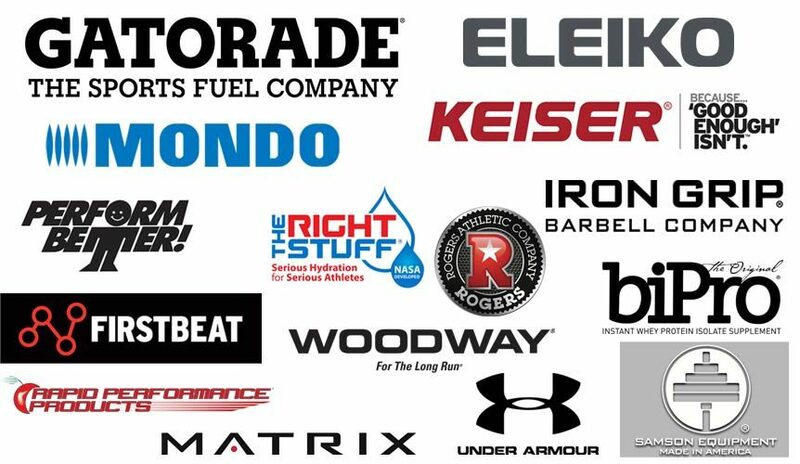 We strongly encourage all CSCCa members to consider the products and services offered by each our generous sponsors when making facility/program purchases. Contact information for CSCCa partnering sponsors can be found on the CSCCa website. 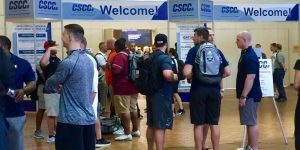 Please be sure to visit the exhibit hall at the 2019 CSCCa National Conference which will be held in Kansas City, Missouri, at the Kansas City Convention Center, May 8-10. We currently have 305 booths and 125 exhibiting companies. Make it a goal to visit each booth to remain up-to-date on the latest developments and innovations in the field ensure you keep your strength and conditioning program on the cutting edge!